-	American open planned kitchen with dining island fully equipped with crockery, cutlery and appliances i.e. four hob electric cooker, electric oven, hood, large fridge, microwave, kettle and hot & cold water dispenser. -	Spacious bathroom with modern glass shower cubicle. -	Tender touch bed and bathroom linen maintained by our housekeeping department. -	Plank wood flooring and charming bathroom tiling. -	32” LG Flat screen TV’s connected to both cable and local television with DVD player. 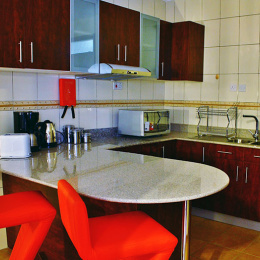 Golfview Apartments & Hotel Nairobi is a self-catering, Bed and Breakfast state of the art serviced Apartment and hotel complex on Muchai Drive off Ngong Road. 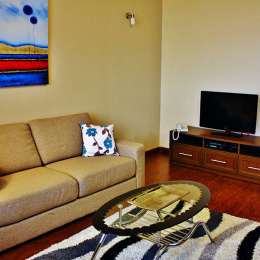 Golfview Apartments & Hotel Nairobi offers tastefully furnished and serviced apartments to international standards. The 42 apartment rooms are furnished with queen size beds as well as other modern room amenities including flat screen televisions, satellite TV, hairdryers, refrigerators and many more. Golfview Apartments & Hotel Nairobi facility offers airport pick up and car hire services as taxi service is stationed at the premises. Also within the apartment facility is an event/ conference centre for different occasions. The in-house Bar and Lounge is fully stocked with wines and liquor for the maximum enjoyment of all Guests. The apartment facility Restaurant is open 24 Hours a day and offers a variety of meals and delicacies. Event facilities are available for Guests and visitors who desire to host large events such as wedding parties, banquets and ceremonies. Golf View Apartments and Hotel houses a Swimming Pool where Guests can take refreshing swimming sessions during the day and a pool bar to service drinks and cocktails. Golf View Apartments and Hotel is close to the City Centre and many shopping malls.